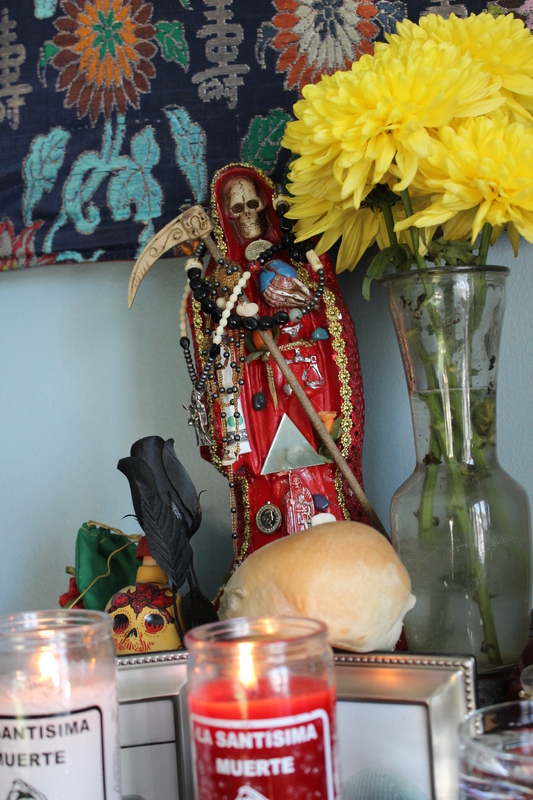 My La Santa Muerte Roja surveys the bolilo roll at Her feet and Her other offerings. Oh, Pretty Girl! Hermosa Niña Blanca! before my person, in my home, and on my path. Holy Death, please relieve me of all oppression, poverty, and despair. I ask that You please grant me_________. Enlighten, with Your Holy Presence, my home, my workplace, and the environments of my loved ones. Award us health, love, prosperity, and well-being. Blessed and praised be Your charity, Holy Death. Lord, I give you infinite thanks because I see Your charity. The challenges I face every day are perfecting my spirit. I always have Your Holy Blessing. You ate Your bread and kindly offered me a piece. Allow me to walk victoriously in the short time allotted to me in this world. Is subject to the immutable weighing of Your Scales. Let not his/her wicked deeds escape Your attention! Bring [NAME] to my feet, humbled and remorseful. See to it that (s)/he never leaves my side as long as it pleases me. Let [NAME] fulfill the promise that was made to me. Feel Your Power, Good Spirit Death! And I rejoice that no force can make me cease loving You. Your mercy is my greatest blessing. I implore that You grant me these favors that I ask of You. Do not ever leave me unprotected.